Dr. Pimple Popper harvests more onion cysts from the back of a very popular patient. Onion man is back! This is his third video, and I know what you're thinking—will I be able to follow along if I haven't seen parts one and two? The good news is, yes, you can watch the third installment Dr. Pimple Popper video without having to worry that you're missing some crucial plot point in the onion-cysts removal saga of this patient's back. Be warned—the audio on this clip is quite serious and may be triggering for other abuse victims. Internet famous dermatologist Dr. Pimple Popper (real name Dr. Sandra Lee) had to remove several large epidermoid cysts (benign growths usually on the face, neck, and trunk, according to Dr. Pimple Popper's caption for the video) from this man, and the cysts have the special quality of resembling onions. The patient talks a little bit about child abuse, so if that's not something you want to hear, you can turn off the sound to the video and just enjoy the lovely extraction in somber silence. 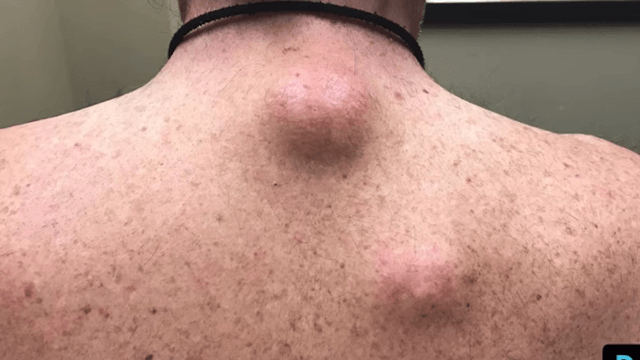 Or you can put on some music of your own, grab a glass of wine (something that pairs well with onions) and watch Dr. Pimple Popper harvest this cyst.